The GAMMEX N95 Respirator and Surgical Mask 112410 & 112411 provide breathable, comfort-fitting protection that filters out 99.9% of bacteria and virus particles such as H1N1, TB, SARS, and other airborne pathogens. Effectively filtering particles down to 0.1 microns in size, the GAMMEX N95 Respirator and Surgical Mask is capable of filtering out the average influenza virus of 0.12 microns. While most respirator type masks are designed to protect both the healthcare professional and the patients from airborne pathogens, Healthcare professionals are often faced with a choice of selecting a mask that trades comfort, breathability, fit and ease of use, for protection. Compromise no longer. • Meets CDC, Health Canada and WHO guidelines for use as an isolation respirator for Tuberculosis, SARS and Influenza exposure control within institutions. • Is approved by the FDA, Health Canada, and CE as a medical device that helps protect both the Healthcare worker and patients from the transfer of microorganisms, blood, body fluids, and airborne particulates during medical and surgical procedures. 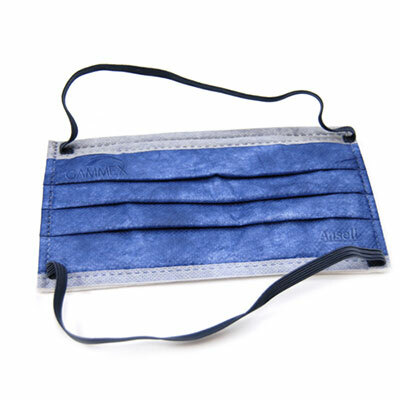 For more information on Ansell’s N95 Respirator & Surgical Masks, please visit www.ansell.com. To view more specifications about the Ansell’s N95 & Surgical Masks, please view the provided PDF. Ansell’s vision is to create a world where people and products enjoy optimal protection against the risks to which they are exposed. After all, what better guarantee is there for increased safety, security and productivity than through adequate protection. During the manufacturing process, products need to be handled guaranteeing their optimal protection, so they meet or exceed the quality requirements described in manufacturing processes.